Indoor palm trees can provide a green, tropical atmosphere to a home living space, purifying the air at the same time. Indoor palms aren't difficult to grow with just a bit of tender loving care. Although indoor palms are available in a variety of different types and sizes, all indoor palms have similar requirements. If possible, give your indoor palm a summer vacation and place the palm outdoors in partial shade during the summer months. Place indoor palms in bright light filtered through a sunny window. Indoor palms do best in natural light. Although different palm varieties have different requirements, all palms will benefit from a minimum of four hours of sunlight each day. Lack of sunlight can cause the palm to lose its lower leaves. Keep indoor palms warm. Indoor palms will thrive in daytime temperatures of 70 to 80 degrees Fahrenheit, and 60 degrees Fahrenheit at night. Don't place indoor palms near air conditioners, open windows or other drafty places. Keep the soil moist, but don't overwater, as soggy soil can cause root rot. Water the indoor palm generously when the top of the soil feels dry to the touch, and allow the water to run through the drainage hole. Pour out any water that remains in the saucer, and never allow the pot to remain in standing water. 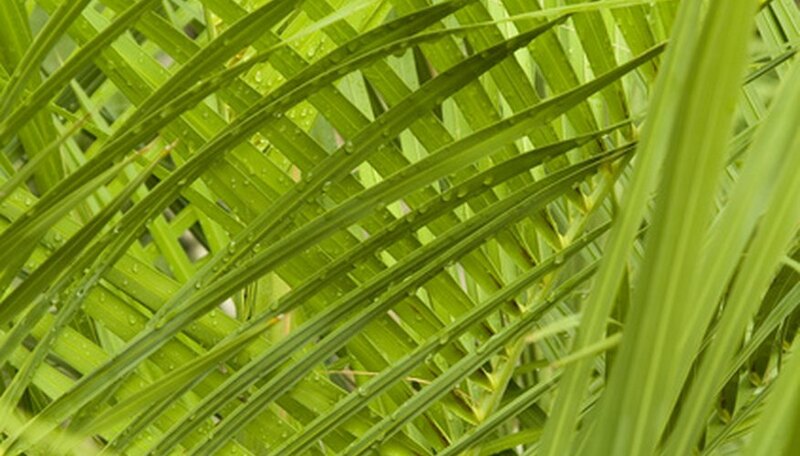 Spray the indoor palm's foliage occasionally to keep the leaves clean, as dusty leaves will invite spider mites. Place the palm in the shower, and rinse it with a fine but strong spray. During warm weather, the palm can be rinsed outdoors. Indoor palms will also benefit from a summer rain shower. Avoid using commercial leaf shine products, which can damage the foliage. Fertilize indoor palms regularly between early spring and early autumn. Use a weak solution of a water-soluble houseplant fertilizer. Mix the fertilizer according to the directions, but dilute it to half-strength. If in doubt, it's better to under-fertilize indoor palms, as too much fertilizer can cause the tips and edges of the leaves to turn brown.